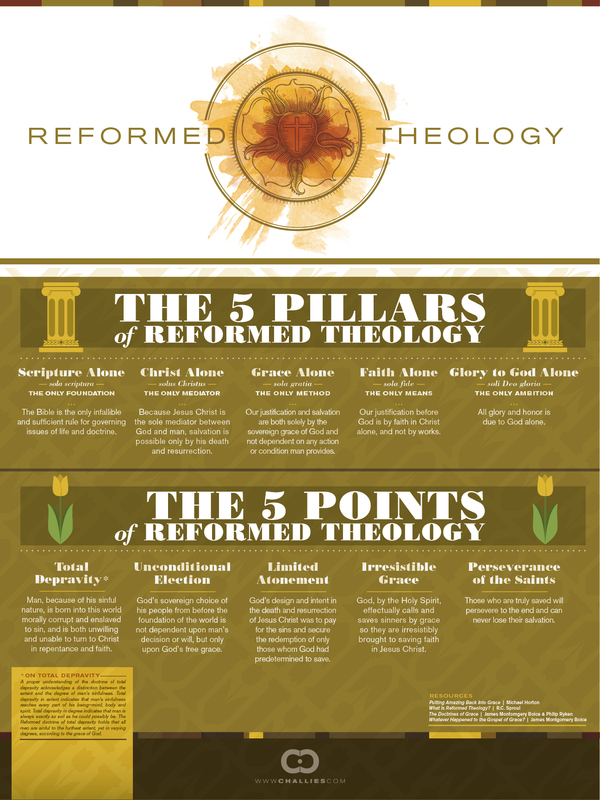 Challies Visual Theology continues with a look at Reformed theology, focusing on the five pillars and the five points of theology that emerged from the Reformation. Click image to enlarge. Also go here for hi-resolution image. A small church makes a big discovery. And it’s interesting to find out how experts know an original 1611 when they see one–there’s a mistake in it. Click here to find out. J. C. Ryle reminds us that we are in a war against an unholy Trinity: the flesh, the world, and the devil. He concludes, “In time of war it is the worst mistake to underrate your enemy, and try to make a little war.” This Christian warfare is no light matter. Read his brief description of each of our enemies in the war and fight! Most kind and trustworthy Father, you haven’t promised us a storm-less, hassle-free, disappointment-empty life. You offer us no formulas for decreasing the probability of sad things happening around us or disillusioning things happening to us. But you have promised something that transcends the uncertainty and the predictable unpredictability of life. You’ve promised to keep us in perfect peace, no matter what happens or who threatens. Hallelujah, several times over! “Being kept by you”… what price tag can we possibility put on such assurance and hope? What bullion can compare what that currency? Father, I treasure the promise of being kept by you. I’ve been convinced afresh that I cannot keep myself. I’m out of bootstraps to pull up; there’s no magic happy pill to take, no fix-it button to push. Thank you for being a Father who will never forget or abandon your children—who will never forget or abandon me. But you’ve promised even more: you’ve promised to keep us in perfect peace. All we have to do is mine the riches of the gospel and keep in mind the wonders of your love. For you are the Lord—the everlasting the peace of God, which transcends all understanding, will guard your hearts and your minds in Christ Jesus. Rock that is higher than me; the Rock of refuge that offers shelter found nowhere else: the Rock of ages from which eternal life flows freely to us. Because the gospel is true, because Jesus is the precious “living Stone” (1 Pet. 2:4-8), I will not despair when I am weak in concentration and focus. Indeed, Father, you’re not calling me to trust in my ability to trust, but to trust in you—in your trustworthiness. For you’ve even promised your children a peace that passes, surpasses, and at times even bypasses all understanding. Hallelujah! What a God you are! How great are your mercies, how profound your kindnesses, how more-than-sufficient your grace. So very Amen we pray, in the name of Jesus—the Prince of Peace. R. C.’s post is worth reading in it’s entirety here. How can I savor God’s Word more? When you read Bible verses in which the author talks about loving or delighting in Scripture itself, how do you usually respond? For me personally, I often feel guilty or anxious about the lack of these verbs in my life. I have even doubted my salvation on occasion when forced to admit that I do not love or delight in God’s word as much as I “should.” Admittedly, there are often things I would rather love and delight in more than Scripture. . . . So how can we go from having little to no love for God’s word to savoring it even more than we would a big, fat, juicy fillet or a delicious canoli? I want to present just a few points of application that will help you to get a taste for the sweetness and sufficiency of God’s word in your life. First, ground passion for all of God’s word in its central message: the glorious gospel of grace. . . .
Second, pray consistently that God would give you passion for His word. Rarely do we ask God to create in us a delight and love for the scriptures. But this is the kind of prayer that God loves and delights to answer. He is beginning to answer mine and he will answer yours. Third, read, study and meditate on God’s word prayerfully and in the power of the gospel. . . .
Lastly, listen to and spend time with those who have a gospel-motivated passion for God’s word. Excerpted from “Learning to Delight in Scripture” by Andrew Kerhoulas.